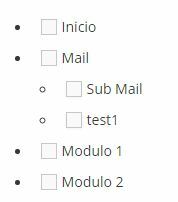 What I need is that when I select "Sub Mail" or "test1" I also select the "Mail", or if I mark only "Mail", I select the 2 items that it brings. When changing the state of a "father", we go up a bit in the DOM to its container <li> , then find the next <ul> that contains the respective children, and apply the same effect ( check / uncheck) to the checkbox elements. When changing the status of one of the "children", if we do a check , we simply do a similar process to the previous one, but in reverse to do the respective "father" check. If we did uncheck of one of the "children", then we go to our <ul> container of "children" and see if there is at least one "son" checkbox selected or not. In case there is one selected, we do not do anything and the checkbox "father" is still selected, otherwise we remove the check from the "father".